Thank you for visiting! This site provides access to results of Pennsylvania's first breeding bird atlas (curing the 1980s) and its second (during the 2000s), as well as some background and brief methods. Species maps of each project are provided as well as lists of species identified within each of the state's 10-square mile blocks, provided under the "Results" tab. 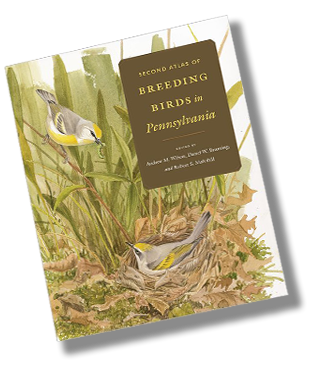 Published in 2012, the "Second Atlas of Breeding Birds in Pennsylvania" successfully completed an update of this statewide assessment of breeding birds. Fieldwork was conducted from 2004 through 2009, documenting nesting by 190 species. Directions to purchase the book are vailable under the "Purchase" tab.